Today in Hong Kong, Vietjet announced the commercial launch of a new route linking Hong Kong and Phu Quoc Island, one of Vietnam’s best loved beach destinations and its operation plan for the Hong Kong market. Attending the announcement in Hong Kong were Vietnam’s Consul General in Hong Kong, Mr. Tran Thanh Huan, Deputy Director-General of Civil Aviation in Hong Kong, Captain Victor Liu, Vietjet Managing Director Luu Duc Khanh, Vietjet Vice President Nguyen Thanh Son as well as various representatives of authorities and travel agents from both Vietnam and Hong Kong. The Hong Kong – Phu Quoc route will operate return flights with a frequency of four flights per week, starting from April 19, 2019. With a flight time of 2 hours and 45 minutes per leg, the flight will depart Phu Quoc at 10:50 in the morning and land in Hong Kong at 14:35; the return flight will depart from Hong Kong at 15:40 and arrive in Phu Quoc at 17:25 (all local times). Known as “the Pearl Island”, Phu Quoc is the biggest island belonging to Vietnam. As one of the most talked-about tourism destinations in Asia with beautiful beaches and friendly local people, Phu Quoc has attracted strong levels of investment in hotels and resorts in recent years and become one of the most popular holiday destinations in Vietnam. Adding to the island’s appeal, international travelers are exempt from visas for visits of 30 days or less. 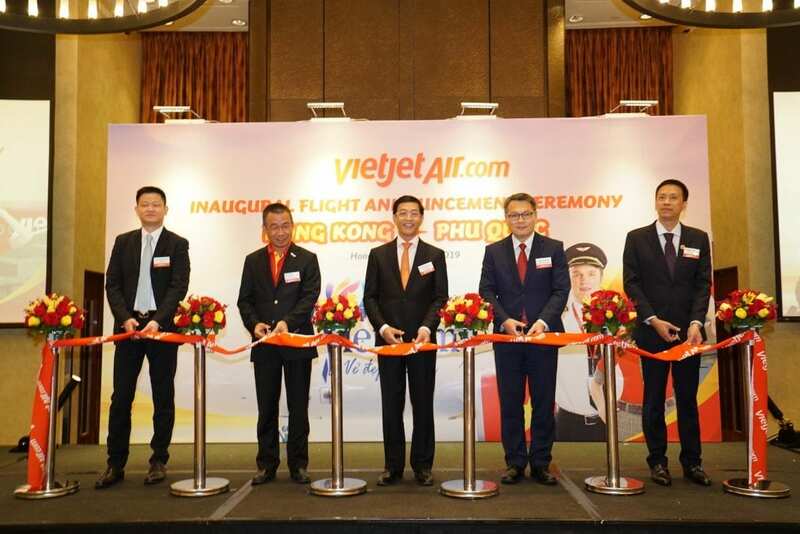 Attending the event, Captain Victor Liu, Deputy Director-General of Civil Aviation in Hong Kong, congratulated Vietjet’s launch of the new service. He remarked that Vietnam and Hong Kong have enjoyed very good and long-standing economic and social relations. With the addition of the direct passenger services between Hong Kong and Phu Quoc, it will no doubt further enrich the bilateral links between Hong Kong and Vietnam. Hong Kong is known as one of the world’s leading centers of finance and commerce, and as a hub for numerous major corporations with headquarters in the Asia-Pacific region. With a blend of Western and Eastern cultures, a vast variety of cuisines, and a developed entertainment industry, Hong Kong is the most loved destination for tourism and shopping for many travelers.